Imagine you are a music lover who were in a jazz festival, that comes for 3 consecutive days with 17 different stages choices every day and offer more than 180 performers. You can see not only the local and foreign artists on the rise at this moment but even world artists that had considered as a living legend and will be noted in history of jazz music world. Bob James, Lee Ritenour, Fourplay, Marcus Miller, Dave Grusin, and George Duke are just some of the name in this Festival. Java Jazz Festival 2013 which had been held on 1 - 3 March 2013 was the ninth edition of the Indonesian pride festival. 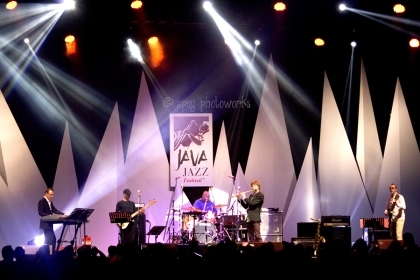 It means nine times that Indonesia has successfully organized a jazz festival growing into one of the best in the world. Indonesia has shown its capability to organize a music festival with dozens of international standard stages. Tagline of Java Jazz Festival (JJF) this time is Jazz Up The World has a meaning JJF is a world-class festival and not least with any other music festival in the world and to bring the message of harmony and peaceful for the world society through jazz music. Festivals celebrated by local and international musicians have become evidence of the development of Indonesian music industry and so the world can see and hear the musicians from Indonesia has a musical aligned with international musician. Music played by musicians from around globe is making the world more colorful. Indonesia gets a lot of attention as music (jazz) festival host, which has become the destination of great musicians to demonstrate their expertise in music. Jakarta International Djarum Super Mild Java Jazz Festival 2013 as its name suggests is a jazz festival and never failed to bring superb musicians of mainstream jazz that typically considered “too heavy”. However, as a flexible music, and has evolved into a variety of flow and a variety of musical styles, Java Jazz is designed to be able to accommodate other types of music lovers. Jazz and beyond, that what Java Jazz go’er used to called it. This ninth edition had present names like Joss Stone, Lisa Stansfield , Basia and Craig David as part of the Special Shows. Also had been enlivened by Spyrogyra, Stanley Clarke, Marcus Miller, Jimmy Cliff, Magnus Lindgren, Gregory Porter, James Carter, Lee Ritenour that perform with Dave Grusin, Roy Hargrove, Kenny Garrett, Earl Klugh, Phil Perry, Ron King Band, Butterscotch, Wouter Hamel, multi Grammy Award winner Chucho Valdes, The Soul Rebels, Bob James, Chuck Loeb, Fernandez, New York Voices, David Garfield, Balance and the Traveling Sounds, George Duke, Jose James, Miles Smiles (Larry Coryell, Omar Hakim, Joey DeFrancesco, Daryll Jones, Rick Margitza), Jose James, Brian Simpson, Fourplay, Eldar Djangirov, Emily Elbert, David Helbock, Roberta Gambarini and Mellow Motif. Also the festival had present two beautiful jazz artist from Japan Monday Michiru, and saxophonist Kaori Kobayashi. Indonesian musicians who has been participate in this festival among others Indro Hardjodikoro The Fingers, The Groove, Indonesian Youth Generation, Dwiki Dharmawan, Abdul and the Coffee Tree Theory, Ade & Brothers, Ginda and the White Flowers, The ExtraLarge, Calvin Jeremy, Indra Lesmana and his Trio named Kayon together with Gilang Ramadhan & Pra Budidharma, The Jongens Quartet, Margo Rising Stars, Glenn Fredly, Oddie Agam, Sister Duke, Storia, BubuGiri, Tulus, For Better Life Movement 57kustik, Tompi, G-PLUCK BEATLES, Barry Likumahuwa Project, Andien, Dewi Sandra, NINO, Matthew Sayersz, and Heaven On Earth. Observing names of artists who had perform, drafting team JJF program seems want to represent this festival is designed for music lovers with many various genres and jazz as an adhesive. Such wonderful blend and right sequences that had offered. Those all artist had been attracted more than 120.000 spectators for 3 days. Well done ! Like every year, the Jakarta International Djarum Super Mild Java Jazz Festival had spoiled the music lovers to feel the excitement and as an audience that for years recognized with label of Java Jazz go-ers , the festival even can make you feel proud of being part of it for months later. Perhaps without realize it, the audience become an important part of festival itself, one of the most important elements of a live performance. Many musicians say that audience reaction and enthusiasm appeared like ecstasy on stage. They seemed trance and improvise in a musical form that they even never thought of before. Welcoming greeting, cheer and singing along when the audience participate following request of the musicians who shouted with their music, no doubt has produced the music itself. Although the show has been over for some time, but reverberations and echoes of the music audience that's still sounds like a long time. We are the music and lets Jazz Up the World and see you next year of 10th years celebration of Java Jazz Festival !